Everything you need to ferment 6 gallons or approximately 30 bottles of your own wine! The Vintner’s Best® Deluxe Wine Making Equipment Kit with Better Bottle® contains all the tools you need to start making 6 gallon batches of your own wine at home. All you need are the included tools, empty bottles, and wine ingredients to get started today! In 4-6 weeks you can have up to 30 bottles of your own home made wine to enjoy and share with your friends and family. This kit is a fantastic investment if you are ready to try your hand at this wonderful hobby and want even more tools than those provided in the standard Vintner’s Best Wine Making Equipment Kit. With this kit and one of our excellent industry respected wine making kits, you can reproduce almost any style of wine. 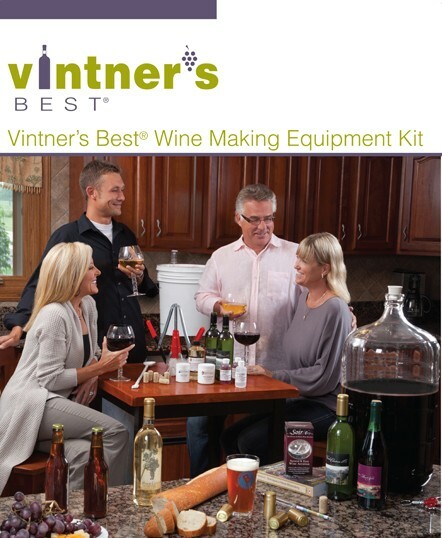 The Vintner’s Best® Deluxe Equipment Kit with Better Bottle® contains the following tools: 7.9 Gallon Fermenter and Grommeted Lid, 6 Gallon Better Bottle® Carboy, Drilled Rubber Stopper, Winemakers Recipe Handbook, Easy Clean No-Rinse Cleanser, Double Lever Corker, 30 – #8 x 1 ¾ Corks, 24” Plastic Spoon, Triple Scale Hydrometer, Econolock, Drilled Universal Carboy Bung, Siphon Hose, Fermtech Auto-Siphon, Bottle Filler, Bottle Brush, and Equipment Instructions.